The Jungle Teacher: Pokémon GO: The Easiest Way To Get Pokécoins (Legally)! 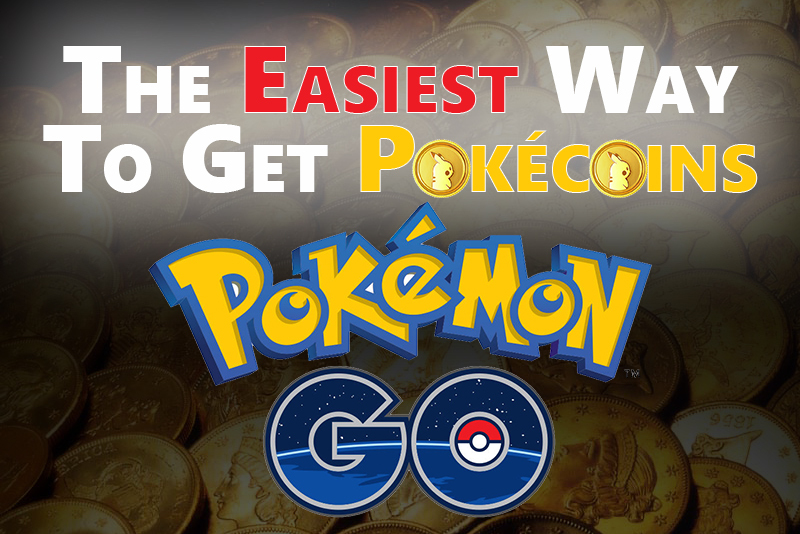 Pokémon GO: The Easiest Way To Get Pokécoins (Legally)! Very important because you don't want to be blocked from the game from using one of those hacks. Also, you don't know what those hackers will do with your login information. If you have read some of the guides online like this one, you would have been mislead. Because they probably cut & paste each other without having played the game & understanding how the Gym Reward system actually works. I read all of them & was mislead for a very long time until I was enlightened by a trainer untainted with such misinformation. 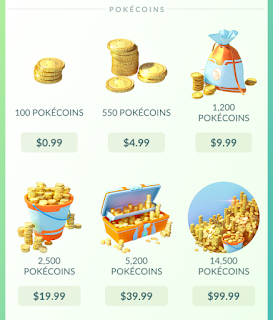 In this blog post, I share a way for even a low-level trainer with low-CP pokémon to get free pokécoins legally. Don't spend your hard earned $$$ to get pokécoins! If you're a cheapo like me, no 1 is definitely out of the question. If you feel guilty for taking advantage of the hard-working game-developers, honestly, they know what they're doing. They won't run out of sponsors, or players willing to spend money in the game anytime soon. Additionally, their numbers are setting new industry standards. Therefore, if you want to help them make money, spending your finite time on the game is more than enough. I'm not going to write about these because there are already plenty of reliable guides out there, like this one. 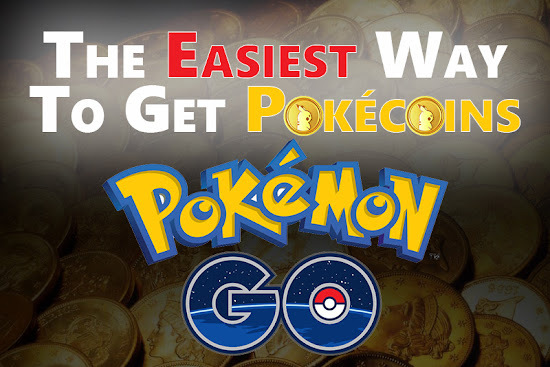 I'll just focus on showing you the easiest way to get free pokécoins legally. You don't even have to do any kind of battle. 1. Scout the friendly gyms in your area. 3. Immediately, go to the Shop - Look for the shield button on the top right corner - Touch it for your reward! You don't need to defend the gym for 21 hours to claim the reward. You can do it immediately after assigning your first pokémon. 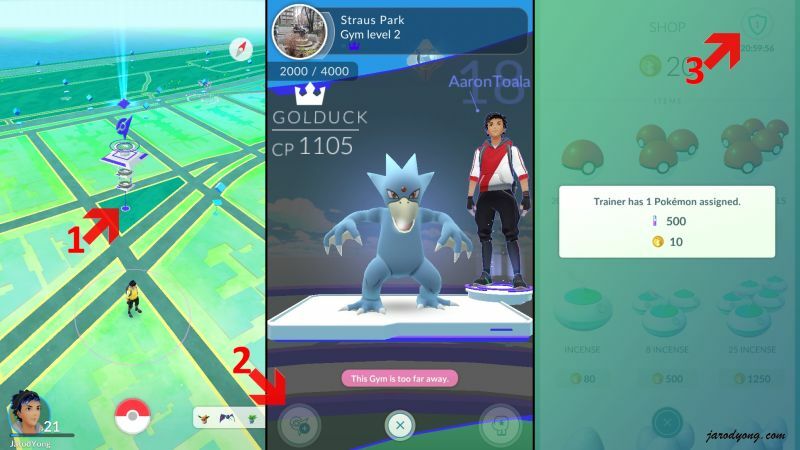 To maximize your reward, after assigning your first pokémon, you'll want to go to nearby gyms & get more pokémon assigned to them. However, it's easier said than done because it's very difficult to hold onto a gym for even 1 hour... Unless you make your move in the wee hours of a weekday morning at a location with a large concentration of gyms. The sad fact of this game is that gym turnovers are extremely high because the game heavily favors gym attackers over defenders. A gym can be taken down even if it is defended by pokémon with significantly superior CP because attackers can use 6 pokémons in succession &, if successful, reduce prestige by 3000 points. Meanwhile, friendly trainers are only allowed 1 pokémon when raising the prestige of a friendly gym &, if successful, add only a few hundred prestige points to the gym. Both can be very time-consuming. Therefore, battling at gyms is a waste of time. Just take advantage of the game's natural trends. Because gym turnover is so high, if you see an attack on a nearby gym, go to it & wait for the attacker to vacate the gym. Then, quickly assign your pokémon to the vacant gym & claim your reward before your pokémon is taken out. Similarly, because turnover is so high, there will be plenty of friendly Level 2 gyms with only 1 pokémon assigned to it. Then, follow the instructions illustrated above. Every gym starts at Level 2 = 2 pokémon slots. Until improvements are made, you're better off working on quickly leveling up your trainer & amassing your pokécoins as a side-task with this stress-free method. Do let me know if this was helpful. Catch em' all!